​Japanese is easy – you just need to be taught the right way. When I learnt Japanese, I did it the hard way – by memorizing sentence patterns, set phrases and random vocabulary. The problem was, I didn’t know how to put it all together. I knew all these various bits and pieces, but didn’t understand why everything works the way it does. I figured it out eventually, but there are so many things I wish someone had taught me. Japanese is actually incredibly logical, flexible and intuitive, but I wasted a lot of time feeling confused and frustrated because it didn’t make sense to my English-speaking brain. That’s why I decided to write 80/20 Japanese. I want to save you from all the difficulties that I faced, and help you understand how the Japanese language really works. 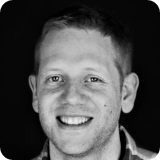 So instead of spoon-feeding you situational expressions with limited application, 80/20 Japanese focuses on what really counts – the fundamentals. It teaches you how the language actually works, and helps you avoid the confusion that most Japanese learners face. That’s the 20% that will get you 80% of the way to speaking fluent Japanese. A complete and easy-to-follow explanation of the basic structure that all Japanese sentences follow. Detailed lessons on all of the building blocks that fit within Japanese sentence structure. Loads of examples and exercises throughout the book to help you understand and consolidate each concept. Discover the simple yet powerful way to transform basic phrases into complex, highly-detailed sentences. After building a rock-solid foundation, refine your natural voice with over 40 useful expressions. Includes language learning strategies that ensure you get the most out of your time. In this edition, all Japanese words and sentences are written in ‘romaji’, the Latin script we use in English. This is perfect if you are new to Japanese and want to focus on learning to speak the language, without worrying about learning all of the different Japanese characters. If your language goals include learning to read and write Japanese, this is the edition for you. In this edition, the Japanese words and sentences are mostly written as they would normally appear in Japanese, whether that be in hiragana, katakana or kanji. The only exceptions to this are in the first few chapters, and where a kanji is particularly difficult or rare. In those cases, hiragana is used instead, although many of these words appear again later in the book written in kanji. This ensures that you never run into a word and have no idea how to read it. At the same time, you gain lots of exposure to naturally written Japanese, so your eyes get used to dealing with kanji. Apart from a couple of small points that relate only to written Japanese, both editions cover the exact same material. This 61-page printable PDF lists every kanji character you will encounter as you work through 80/20 Japanese, in the order they appear. Everything you'll learn, chapter by chapter. The key to the effectiveness of 80/20 Japanese is the logical order in which the lessons are presented. 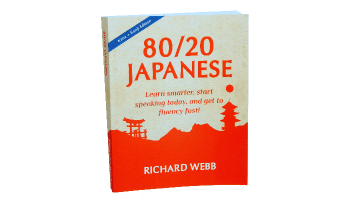 By teaching everything in the right order, 80/20 Japanese ensures that every new concept and sentence pattern you learn makes total sense. It starts with the obvious first step – pronunciation. Chapter 1 teaches you all about the different sounds used in Japanese so you can pronounce Japanese words correctly. Next, in Chapter 2, you will learn the fundamental structure of Japanese sentences. This includes a clear, easy-to-understand explanation of the oft-dreaded particles and how they work. By learning this right from the beginning, you build a foundation for everything else you will ever learn about Japanese grammar. Most books and courses skip this vital step, and instead start with specific phrases and sentence patterns, which results in you knowing how to say certain things, but not how to make different word combinations make sense. By giving you a better understanding of how Japanese sentences and particles work from the beginning, 80/20 Japanese lets you avoid the confusion that most Japanese learner’s have to deal with at every turn. Adding to your understanding of how Japanese functions, Chapter 3 covers the essential cultural understanding you need to speak Japanese effectively. These are easy but important lessons that are applicable every time you use Japanese. By this point, you’ll have learnt the most important ~20% of the language that gets you ~80% of the way to fluency. From here, you will delve deeper into each of the different components of the language. Chapters 5 and 6 teach you all about numbers and expressions of time, respectively, with lots of examples and exercises that teach you how to use them in a sentence correctly. These chapters cover the finer points of the major word types – adjectives, nouns, adverbs and verbs. With these chapters, you’ll learn how to correctly use each word type in almost any combination, allowing you to speak and understand Japanese with greater flexibility and precision. Chapter 10 really takes you to the next level. It teaches you all about noun phrases, which have a wide range of uses and give you the ability to talk about things in far greater detail. For example, instead of saying something simple such as, “I ate lunch in Shinjuku with my friends”, noun phrases allow you to say things like, “I ate lunch at a new restaurant in Shinjuku with some friends that I met at high school“. Noun phrases are incredibly powerful, yet fairly simple to put together, especially in Japanese. This chapter covers them in detail. As a key building block of the Japanese language, particles are of course covered right from chapter two, with more added along the way as needed. This chapter provides a far more detailed look. The lessons in this chapter are not essential to being able to speak Japanese, but they will give you a deeper understanding of how different particles work. This will help you avoid the more subtle mistakes that even some advanced Japanese speakers sometimes make. This chapter also answers one of the biggest questions that even confuses people who have been studying Japanese for years – the difference between the particles “wa” and “ga”. By the time you reach Chapter 12, you will have a very good understanding of Japanese. This final chapter simply builds on everything you know by introducing 40 useful expressions, all explained – with examples – in the context of everything learnt throughout the rest of the book. At the end of the book, you'll find a few handy additions for easy reference. Verb dictionary listing polite and informal/dictionary forms of all Japanese verbs used throughout the book. Includes Japanese-English and English-Japanese dictionary. Non-verb dictionary listing all other Japanese words used throughout the book. Includes Japanese-English and English-Japanese dictionary. I love the book so far. I've tried other sources but nothing has engaged me and kept me motivated to study Japanese like this. It's crazy how in one month I've gone from only knowing a few words to actually being able to put together a lot of sentences. It helps a lot how you teach Japanese from an English speakers viewpoint. 10/10 so far. I wish there was this format book for Spanish and Russian as well. I've tried lots of other less successful learning tools. I'm only a few chapters in but it's already given me the clearest, most understandable explanation of the particle system. I skimmed ahead and really like how verb tenses were handled. Love the logical break down of the concepts. I really appreciate the order you are teaching things. It is very clear and straightforward. 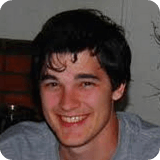 I'm an ecologist/research student but also did a degree in classics (i.e. Latin and Ancient Greek) a few years back and your ability to explain grammar simply, concisely, and empathetically beats anything I encountered in the many ancient language textbooks I used (written by professors and linguists no less!). You've got a fantastic feel for the perspective of the English speaking student. Well done mate. Seriously. If you’re not completely happy with 80/20 Japanese, simply reply to your purchase confirmation email within 30 days for a full refund – no questions asked. The Complete Package includes all of these items. Smaller packages are also available below. 425 page eBook with all Japanese words, phrases and sentences written as they would normally be written in Japanese. Perfect if you truly want to master all aspects of the Japanese language. 425 page eBook with all Japanese words, phrases and sentences written in Romaji. 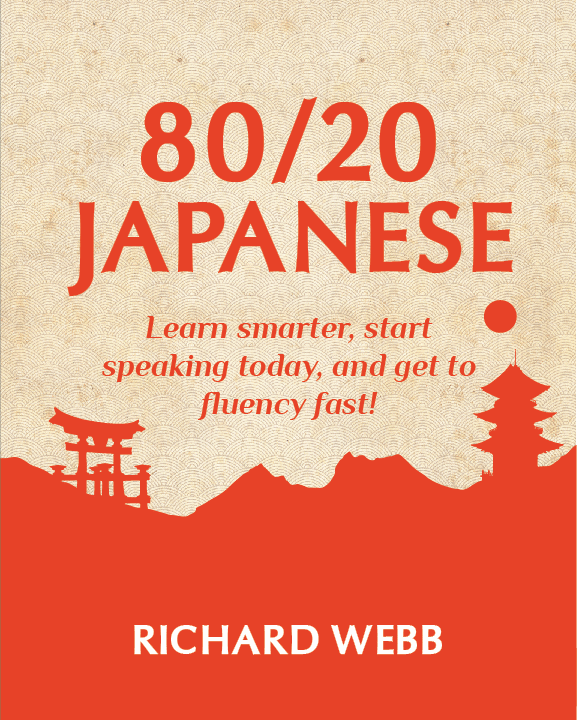 Ideal for learning how to speak Japanese without worrying about learning all the characters. 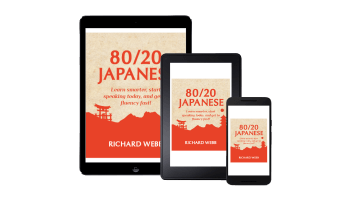 In addition to the PDFs, both editions of 80/20 Japanese are included in ePub and Mobi formats for a better reading experience on your Kindle, Nook or other mobile device. 61-page printable PDF featuring every kanji used in the Kana + Kanji Edition. Click here to see details above. Physical (paper) copy of 80/20 Japanese. Ships to most countries worldwide. Choose from Kana + Kanji Edition, Romaji Edition, or get one of each for +$20. The complete book narrated by the author, including all Japanese example sentences, exercises and answers. Listen and learn on the train, in the car or while working out. Start making sense of Japanese today! The complete book narrated by the author. Listen and learn on the train, in the car or while working out. Get a physical copy of 80/20 Japanese in the edition of your choice, or get both for +$20. Click here for AUD pricing. Read Chapter 2 now, and for free! Includes the complete Table of Contents, so you can see exactly what you'll learn. Japan and the Japanese language have been a huge part of my life. I first went to live in Japan when I was 15, and have since spent over 6 years living in the country. I have a degree in Japanese, studied linguistics at a Japanese university, passed the highest level of the Japanese Language Proficiency Test (JLPT), and worked for two Japanese companies where virtually all communication was in Japanese. It was a long road and it wasn't always easy, but learning to speak Japanese has been one of the best things I've ever done. It's opened many doors, and allowed me to have some amazing experiences. I hope that this book helps you get as much out of Japan and Japanese culture as I have. Do I ultimately want to be able to read and write Japanese? If so, the Kana + Kanji Edition will probably be better in the long run. It will likely be more challenging at the beginning, especially if you are not yet familiar with hiragana, but as you progress through the book and your reading skills improve, the Kana + Kanji Edition will actually become easier to read. Plus, you always have the Romaji Edition eBook to fall back on if it becomes a bit too much while you're still getting used to the characters. If, however, you are mainly only interested in learning to speak and understand spoken Japanese, the Romaji Edition will be much easier to work with as you will have one less (very large) obstacle in your way. This really just depends on two things - your budget, and how you like to learn. I can't tell you your budget, but I can try to address the other point. Some people like physical, paper books because they find it easier to take notes and flip between pages. If that's you, you'll probably appreciate a physical copy. If, on the other hand, you're happy reading on your smartphone, tablet, computer or other e-reader, then the eBook should do the job - the content is the same. The audiobook is popular with people who like to learn or revise lessons while driving, sitting on a bumpy bus, or even as they go to sleep. Others just like having audio of the Japanese example sentences and exercises so they know how everything is supposed to sound. If you're still not sure, then it may help to know that you can upgrade later at our dedicated upgrades page. Currently, the price is equal to the difference between the package you have and the package you are upgrading to, plus an additional $5 USD. Yes! There is a dedicated upgrades site through which you can upgrade at any time. Currently, the price is equal to the difference between the package you have and the package you are upgrading to, plus an additional $5 USD. Can I purchase a soft cover book only? Sorry, but no. With all packages, the main thing you are purchasing is information. The eBook is this information in its purest form. Physical books offer additional value on top of this, and they also cost more to produce and manage, hence they are sold for a higher price. The eBook is included in the Soft Cover Pack simply because it contains the exact same information that you pay for by buying a physical copy. Is the book available to buy in book stores, or online at sites like Amazon? 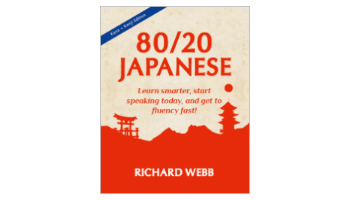 No, sorry, 80/20 Japanese is currently only available to purchase on this website. There are no plans for this to change in the near future. Sorry, no. Just like any eBook bought on Amazon Kindle or Apple iBooks, the eBook is intended for digital use and cannot be printed. For a printed copy, please purchase the Soft Cover Pack or The Complete Package. We ship worldwide. Will 80/20 Japanese help me with the JLPT? 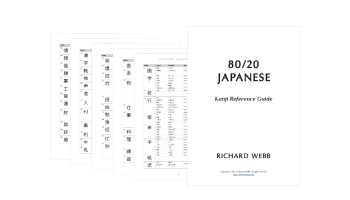 80/20 Japanese was not written specifically for the JLPT, but it will give you a very solid understanding of the fundamental grammar concepts that are tested - either directly or indirectly - in the exams. 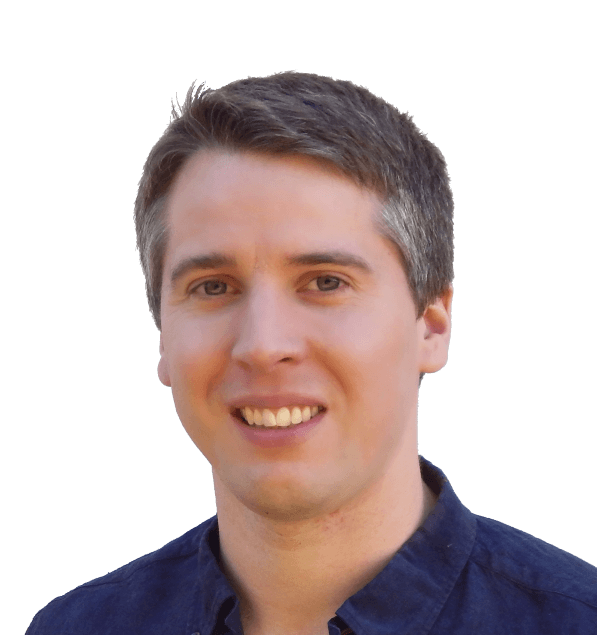 The biggest difference between the different levels of the JLPT is quantity - primarily the number of words and expressions you can understand and interpret in context. 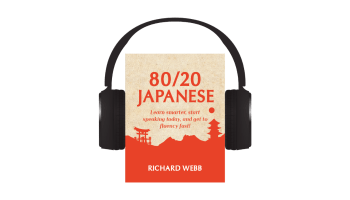 80/20 Japanese focuses on ensuring your quality of understanding is high, because that gives you a strong base to build everything else up on. Quantity is important too, but a good base makes it much easier to learn new words and expressions so that you can actually use them, which also helps with memorization. Bottom line, if you learn everything in 80/20 Japanese and nothing else, you should be able to pass N4 comfortably, depending on your listening ability. To go from there to N3 and beyond, you would likely need other resources targeted specifically at those exams, but this should be much easier than if you studied only what was necessary to pass N4. Once your payment has been processed (usually immediately), you will be re-directed to a web page where you can download the digital files included in your chosen package. You will also receive an email with a link to the download page, as well as a receipt for your purchase. If your package includes a physical book, we will process your order as quickly as possible and send you an email when the book has been dispatched (usually within 2-3 business days). Does the download link expire? The download link expires after a period of time and a certain number of download attempts, but this is only to prevent abuse. If you missed the download window, lost the files, or need to access your files again for any other reason, please contact us and we'll re-activate your download. Do you ever have sales or offer discounts? For existing products, no, and this is good for everyone. Why? A couple of reasons. Firstly, it means that there is no chance that you will buy the book one day, only to find that it has been discounted a week later. That's an awful feeling that I do not wish to inflict on anyone. Secondly, it means that you have no reason to put off learning Japanese. 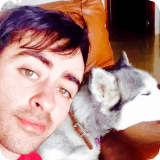 If you want to learn or improve your Japanese, now is the best time to start. The hope of a sale gives you a reason to wait, and for every day you wait, that is one day lost that you could have spent learning and improving. The price will never be lower than it is right now, so if you want to start, start now and don't look back. The only time we ever intend on having a sale is when releasing a new product, but this won't affect the price of existing products. Is there a student or military discount available? Sorry, no, but we can offer a bulk discount if purchasing a large number of copies for a class of students or study group. If this interests you, please contact us. How much do the packages cost in other currencies? All sales are processed in US dollars (customers in Australia can also pay in AUD), and this will be converted to your local currency by your bank or credit card issuer using their exchange rate at the time of purchase. For a rough estimate of the amount you will be charged in your currency, please visit http://www.xe.com/. Please note that this should only be used as a guide, and your bank's rate will likely differ and include a small currency conversion fee. I live in Japan but don't have a credit card. How can I purchase the book? PayPal is also available, but if you are unable to create a verified PayPal account without a credit card (as is usually the case in Japan), one alternative is V-Preca, a prepaid debit card that can be topped up at Japanese convenience stores. There are a few steps involved in getting set up, but once completed, you will have access to a virtual debit card that can be used like a normal credit card for online purchases. You can now also purchase 80/20 Japanese with Bitcoin. Can I purchase multiple copies at once? Yes, of course! Please click here to visit our product list page, where you can add items to your shopping cart and adjust quantities before proceeding to the checkout. Please note that this page only allows for payment in US dollars. To purchase multiple copies with Australian dollars, please contact us. Don't wait - Start speaking today! © 2019 Raw Lisard Pty Ltd. All rights Reserved.